Who is better suited to tell history than the people who experienced it? Read the stories of some American nurses during World War II. Read firsthand accounts from soldiers who spent the terrible winter of 1944-1945 on the front lines in Europe. Browse the faces of some who were at the Bulge. The following texts are excerpts from Diane Burke Fessler's No Time For Fear: Voices of American Military Nurses in World War II (1996). In July, the Fifty-sixth General shipped over from England to France to set up a tent hospital. One of the hard things about working in a tent hospital was that cots were so low we had to kneel by each one to keep from bending over all the time. Liege, Belgium was our next destination, and we were glad it was a building instead of tents. 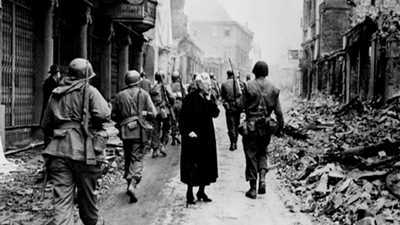 During the Battle of the Bulge, in December we were so close to the fighting the patients had to be evacuated. They were just about to evacuate us nurses when the Germans retreated, and we stayed. The casualties came in so fast, nurses had to start blood transfusions, which only doctors had done before. Whatever needed to be done was done by everyone. There was no limit. I'll never forget those young patients, hurt so badly. I felt worse when I saw they were wearing a wedding ring. 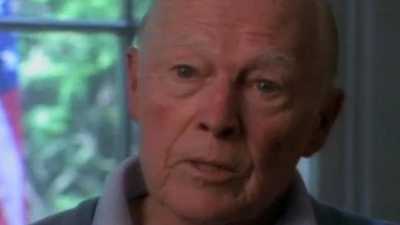 Crossing the English Channel in August 1944 was an experience I'll never forget. One hundred five nurses waited and waited on the dock, finally being told that all the cabins on the British ship were given out and we would sleep in the crews' mess hall, in the very bottom of the ship. With the cheery words, "We know what jolly good sports the American nurses are," they hustled us aboard and down several wall-mounted ladders to E deck. We slept in three layers, "Upper" was hammock, "Middle" was on the crude wooden mess tables, and "Lower" was on the floor. I drew a spot on the floor by an open pipe which dripped water and smelled like a sewer. We ate in this dungeon also, being served the same food the crew ate. Another nurse and I made friends with some American officers on A deck, who snitched food for us from the officers' mess. It took three days to cross a distance of twenty miles. The commanding officers of the various units on board were said to be squabbling over who would get to be the first to land on Utah Beach in Normandy, even though the famous invasion was long over. When we did land, it was about midnight, in a cold rain. Then we waited several hours for transportation, without either raincoats or bedrolls, resting in the wet sand. Our next stop was a cow pasture, literally. Being a city girl, it seemed wherever I turned there were cows in my way, even in the creek where we had to bathe and wash clothes. We had nothing to do for weeks, and the boredom magnified all the primitive details of our camp. The latrine was unforgettable. At first we had a slit trench dug in the ground, about twelve inches wide. The idea was to straddle it and squat. It was raining everyday and water filled the trench, with mud all around. Surrounded by a wall of canvas, the latrine was open to the sky, and the Army Air Corps pilots loved to fly overhead and dip their wings at us or swoop low. One memorable day, our chief nurse made a visit to the trench, assumed the position, slipped in the mud, and fell "kerplunk" right into all that excreta. I have to tell you a bit about her before I go on. Absolutely no one got along with this woman, except the commanding officer, who was equally unpopular. Everyone called her Aunt Fanny, the traditional nickname for Frances. As news spread around the camp about Aunt Fanny's predicament, there were many cheers and, in the evening, several glasses were raised in celebration. Soon after her adventure a set of wooden privy seats was delivered to us nurses. What a sight: a twelve-holer, surrounded by canvas! Our drinking water was from a lister bag, and purification tablets were dissolved in it, which made it taste strongly of chlorine. We were allowed one canteen of water each day and added lemon crystals from our K rations, which were small cardboard boxes filled with hardtack crackers, a tin of either cheese spread or potted meat, a fruit bar made usually of ground raisins (on rare occasions ground dates), an envelope of lemon crystals, and envelopes of powdered coffee and sugar. Sometimes we had the dreaded D rations, which made K rations seem like a feast. D rations were only thick, heavy, sweet and strong chocolate bars, loaded with vitamins. If you gagged just trying to eat them, you could always dissolve them in hot water and have hot chocolate. My pal, Aggie Flynn, and I walked along a country road one day in search of some normal food, and since we both spoke French, made a deal with a farmer's wife for tomatoes, potatoes, onions, and two pork chops. We hustled them back to our tent, made a small fire on the ground between our two cots, and cooked a sort of stew. All went well until the smoke seeped out through the tent seams. Naturally, Aunt Fanny came charging across the pasture and caught us enjoying a feast. "You can't eat food from the local farms," she shrieked. "It could be contaminated." We ate it. Besides cows, we had apple trees. The apples were sour and not good for eating, but were grown for making Calvados and cider. Calvados is a bad-tasting alcoholic beverage, but the old lemon crystals helped the flavor when, on a few occasions we sat on the grass, at eventide, trying to create an officers-club atmosphere and chatting with the medical officers. The army way of getting somewhere just to wait created an almost unbearable boredom among our camp. Singing was one of the few diversions, and having had voice training, I was often called upon to sing requests as we sat in front of our tents at twilight. We didn't just sing songs that were popular, either. Some clever nurse or G.I. would use the tunes everyone knew and make up words to show our feelings about the situations we were in or to express something about our jobs. The men made up words about women, and the nurses made up songs about men. Parodies of songs I remember singing over and over were to the tunes of "Bless Them All," "Mademoiselle from Armentiers," and "Roll Me Over in the Clover." The length of the song "Alouette" became so tiresome, but there was one doctor who would start it and, naturally, we couldn't drop it until all made-up verses covering the entire human anatomy were sung. We were waiting to move into Paris after it was liberated from the Nazis, and in early September, we received orders to proceed in a truck convoy. 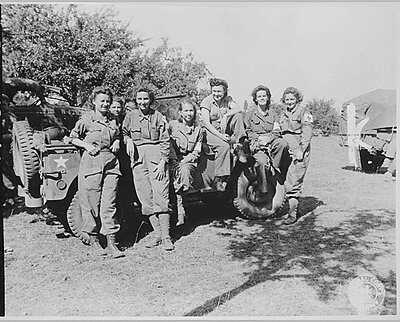 Our unit was the first hospital to enter Paris, and our executive officer, Colonel Wiechman, asked my friend Aggie and me to ride in the lead jeep. I rode in the passenger seat, thus was the first American nurse to enter the "City of Light." We took over the old hospital from the Nazis. I was later transferred to a hospital train unit and made many trips from the front to Cherbourg. The invasion of Southern France began, and the Tenth landed right behind the troops, who were moving very fast. The rains really came down in October 1944, and the whole countryside was a sea of mud. We sank to our ankles every time we stepped outside, but the engineers made wooden floors for our tents. We had many patients, including French soldiers and civilians. We traveled by convoy, and once our truck picked up a hitchhiker carrying a gunny sack over his shoulder. We asked what was in the sack, and he explained that he was part of the French underground and was taking the remains of his buddy back home. He departed near Lyon with his burden. In Strasbourg we were housed in university buildings. The Germans left behind patients who could not be moved, so we had to care for them. 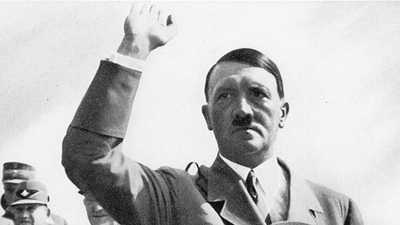 A few German doctors and nurses were taken captive, and I was startled once to hear a nurse reporting, "Heil Hitler," before she left the building. The local people in Strasbourg were French citizens but spoke German, and there were many German sympathizers who were barely civil to us Americans. The Americans took over the home of a German couple who had refused to return to Germany, and one night I went there with some other officers before the couple moved out. They served us in their living room, and we listened to their radio. A few days later, when they moved out, the people threatened them, and they hanged themselves. Refugees were everywhere in France, as in Italy and Sicily. They walked for miles, taking whatever they could carry or load on a cart. Food and medicine were scarce. We eventually were able to rest, and I went to Paris on a three-day pass with another nurse. We were stopped several times by the M.P.s and asked to give the password of the day. If we didn't know it, we were asked about baseball teams until we could come up with some answers. A Jewish doctor with our unit had relatives in Paris and asked us to deliver food to them while we were there. They hid out during the war, and we had to be very "hush hush." We found the address he gave us, a man opened the door, and we gave him the food. He was reluctant to talk, but we felt we had accomplished something important. In France, the Tenth Field Hospital moved constantly, following the troops fighting the Battle of the Bulge. We moved from buildings to tents, and back to buildings, depending on where we were. Sometimes the patients had to be moved from one floor to another for surgery, which was a hard job for the corpsmen. A few French nurses were attached to our unit for a while. Near Saint-Avold, the Allies fired artillery shells over our building, then the German artillery landed close to us, but luckily we were never hit. One nurse was using her helmet to bathe when the firing came too close, so she dumped out the water, put the helmet on her head, and sat there naked until the firing stopped. Patients came by ambulance and helicopter all day and night. It was overwhelming. When I tried to rest, I couldn't sleep, thinking of all those wounded patients and all that needed to be done for them. There were some I cannot forget to this day, like one whose leg was amputated, and when he was told, he was so furious he wanted to die. There was little we could to do comfort him. Another man's jaw was nearly blown off and he needed more care than was available in our field hospital, so we hurriedly evacuated him to a larger one. Some developed kidney failure from shock and injuries, and died because there was nothing we could do for them there. After working in England for several months, right after D-Day in June 1944, we were sent to France and landed on Utah Beach. When people argue about women being in combat, I think how silly they are, because we already were. In France we had 88mm artillery shells flying right over our heads. It was unsettling to hear the 88's, but we figured this was what war was like. When the ships unloaded, everything was piled up for each unit in an area called the "dump." Every day our officers went out to look for our equipment, going from one "dump" to another. About the fifth day they spotted a pile of boxes with an ironing board on top of it, and said, "That's ours!" Our first destination wasn't really captured by the Americans for a month after we landed, so we moved several times. Today, we take so much for granted about running water, electricity, and bathrooms, for instance. Living and working in tents was a different story. I can remember getting up in the night during heavy rains and having a river of water running through the middle of the floor. The men who put the tents up forgot to dig a ditch around them. When it rained, the tent ropes had to be tightened up, and when they dried, we had to loosen them, or the tent would be down on top of us. Our field hospital was designed to have three one-hundred-bed sections. 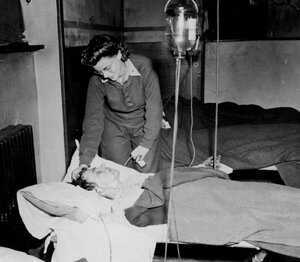 Patients were brought from hospitals at the front, and we cared for them until planes came in to take them to England. There was a small landing area for C-47s. One day an evacuation plane didn't have any nurses to accompany patients, so two of us were ordered to rush and get on board. It was my first plane ride. When the plane landed in England, we were taken to quarters, but then we didn't know what to do or where to go, and the flight nurses absolutely ignored us. The only money we had was French francs. The next morning we found a plane headed back to France, and landed at a small airstrip some distance from our's. Again we were ignored. We hadn't eaten anything since the day before, but finally found a D ration chocolate bar. By afternoon we found a place to eat and then decided to hitchhike back to our camp. The P-38s were small, fast fighters, and they were hedgehopping very low to the ground all around us. In the evening we had pilots coming over to meet nurses, and they told us how they hunted for the tents with red crosses on top. About five days after Paris was liberated, the Eighth Field Hospital moved to Le Bourget Airfield. Finally, we were in buildings. Our patients usually came to us three to five days after being injured, and we prepared them for air evacuation. The hospital was an old school building with litter patients on the first floor and ambulatory patients on the second. The enlisted personnel were quartered on the third floor. Officers were quartered about a block away, at an inn, and we walked back and forth. Stationed there was a platoon of about one hundred men and officers who handled litters for us and did various other jobs. The officers were white, but the enlisted men were black. They were great, and we worked well with them. There was also an ambulance company that worked around the clock, picking up patients coming in from the front at the train station. During the Battle of the Bulge, we shipped out close to seventeen hundred patients, and received about eight hundred more in one day. Approximately seventy-five thousand patients went through our hospital during the six months we were there, so we had to work well with everyone under those circumstances. Our medical work was interesting. We had orders to exteriorate the gut when a patient had any gut surgery. With so many patients having abdominal surgery, some of the intestinal holes might be missed, so when patients finally reached the hospitals in England, their intestines were put back in. We did a lot of cast splitting, because of the chance of swelling. It could happen in a plane because of the pressure, and the cast might need to be pried loose. One poor patient I remember had fractures on arms, shoulders, and leg. He was in plaster basically from his neck to his feet. They had not made a hole for his stomach, and he couldn't eat much because of bloating. He was so relieved when we split his casts and opened the cast over his abdomen and buttocks and taped it so it didn't rub his skin. Paris had a lot of excitement for us to enjoy, and we often went downtown to the opera house in our free time. It was fantastic. Before the last act though, we all tried to rush out because they played the national anthems of France, United States, and Great Britain, and we had to stand at attention through all three. Who is better suited to tell history than the people who experienced it? Read the stories of some American soldiers who spent the terrible winter of 1944-1945 on the front lines in Europe. H.W.O. Kinnard remembers General McAuliffe's reaction to the German surrender ultimatum.